← I am homeless . . . There are many ways to approach this subject. The best way to do this is to make everyone go through a “Dogma Detector.” Don’t worry, It won’t hurt . . . much! So step up, put your theological suppositions, dogmas, and theories into the white plastic tray and then step through the “Dogma Detector.” Don’t worry, you will get your theological suppositions, dogmas, and theories back after this post . . . if you still want them, that is. What was that?!? The “Dogma Detector” is beeping! Are you trying to sneak a man-made doctrine into this teaching? Tsk, tsk, tsk! That is not going to work. Please, check ALL of your pockets and empty all of your theological suppositions, dogmas, and theories into the white plastic tray. Thank you. Noah Porter, ed., Webster’s 1913 Unabridged English Dictionary, (Springfield, Mass. : G. C. Merriam Co., 1913), WORDsearch CROSS e-book, Under: “Theology”. In layman’s terms and to keep this simple, theology is a belief system. Theology is a little bit different than religion in that religion is a practice based upon a theology that is believed to be true. Now we get to the 2nd word in Theological Supposition . . .
1. The act of supposing, laying down, imagining, or considering as true or existing, what is known not to be true, or what is not proved. 2. That which is supposed; hypothesis; conjecture; surmise; opinion or belief without sufficient evidence. Noah Porter, ed., Webster’s 1913 Unabridged English Dictionary, (Springfield, Mass. : G. C. Merriam Co., 1913), WORDsearch CROSS e-book, Under: “Supposition”. In layman’s terms, and to keep this simple too – dogma. Even simpler? Theory. Theory, dogma, supposition. They are all synonyms. Do NOT take my word for ANY of this! Check what I am saying against the text! Do NOT become sheep blindly following! That is a good way to end up in the slaughterhouse! Open the text and VERIFY! Whether it be with me or anyone else, YOU must do the work! Do NOT accept until you have verified! I can not say this in strong enough terms! Is Salvation a single moment in time? A single confession of faith securing an eternal destiny? A momentary and single acceptance that gives eternal life? 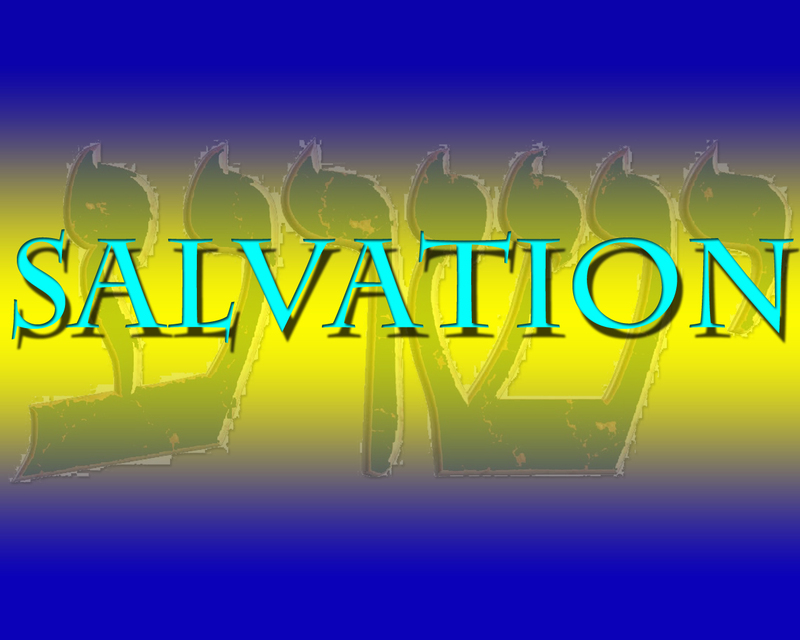 Is Salvation a life lived for God? Without getting into it too deep, the word in the text is sōzōmenoi – being saved. It is a verb that is normative, plural, masculine, participle, present and middle. Simply put, in the process of . . .
That also exposes some theological suppositions, dogmas, and theories quite easily, doesn’t it? I have written on many of these topics in detail already so I am not going to in this post to keep this post shorter. They were necessary to ask though because we are talking about the 2 steps to gaining eternal life and it is foundational to being able to understand what those two steps are. Theological suppositions, dogmas, and theories make it hard to see what is being said in the text. They color the text and what it is conveying just like sunglasses do when they block out certain spectrums of light – certain colors. Before we see what the text says, let’s go to some of the top Christian, Messianic and others sites on the web and see what they say one needs to do to gain eternal life . . . I will tell you right now that it is difficult to find papers by the following that address this subject directly and to the point. Last night I dreamed I was dying and woke up in an agony of fear. Today I know I am not ready to die. What must I do? God may have permitted you to have this dream to make you realize that you have neglected the most important thing in this life and in the next. You can have peace in your heart and the assurance of salvation if you will humbly acknowledge yourself as a sinner in God’s sight, ask His forgiveness and cleaning and trust in Jesus Christ, God’s Son as your Saviour from sin. Christ died on the Cross to do just this very thing for you. Let me urge you to get a Bible and read, or ask someone to help you read the following verses: Romans 3:12, Romans 3:23, II Timothy 3:5, Romans 3:19, Ephesians 2:8, Luke 19:10, Romans 5:8, Hebrews 7:25, Romans 10:13, and Romans 10:9, 10. These are not magic verses. They simply tell us about our need and how to find that need met in Jesus Christ. You do not have to do some wonderful thing to be saved. All you have to do is accept the wonderful thing Christ has done for you. After you have this assurance in your heart tell other people about it. Also, show by your daily life that Christ has changed it for His own glory. The Bible says that if we believe on the Lord Jesus Christ we shall be saved. However, the Bible does not present faith as simply “mental assent to the facts of the gospel.” True saving faith involves repentance from one’s sin and a complete trust in the work of Christ to save from sin and make one righteous. The Reformers spoke of three aspects of faith: recognition of the truth claims of the gospel, acknowledgment of their truthfulness and exact correspondence to man’s spiritual need, and a personal commitment to the Lord Jesus Christ who, by virtue of His death, provides the only sufficient sacrifice for one’s personal sin. Any one of these three aspects of faith, taken by themselves, is insufficient to meet the biblical definition of saving faith. However, the presence of all three components together results in saving faith. In other words, saving faith consists of mental, emotional, and volitional elements. Saving faith involves both the mind and the will. Paul in his letters lists many things that God requires of us – after all, we have received Jesus as our Lord and it is now our sacred calling to do His will – not to be saved but because we are saved. Just take out your Bibles and read Ephesians 5:1-6 (or, if you like, start in the fourth chapter and read through to the end of the fifth) and very clearly, Paul tells us how we are to live and warns us about the dangers of deviation from God’s ways. Or read 1 Thessalonians 4:1-8 (again, among many other passages), where Paul lays out what God requires of us as His children. Jesus paid for our sins once and for all on the cross, but the blood is applied to our lives the moment we are saved and then in an ongoing way once we are saved (notice the present continuous tense of the Greek in 1 John 1:7). What are the most basic things a person needs to believe in order to be saved? So I take texts like that and begin at the core—the death of Jesus. He died for our sins, which means I must believe I am a sinner. A person that doesn’t believe he is a sinner can’t be saved. If there is nothing to forgive, Jesus didn’t do anything for me. If he didn’t do anything for me, I’m not believing him for salvation. If I’m not believing him for salvation, then I’m not saved. So you must believe you are a sinner. You also must acknowledge what Jesus did. He lived the perfect life. I don’t think you can believe that Jesus sinned and still be saved. Because then the sacrifice made for you was not what God required, and you aren’t believing in what God did for you. So Jesus is the sinless Son of God and he gives himself up to die in my place. This substitutionary dimension of the death of Christ for my sins is necessary. There are lots of ways the Bible talks about this and I think you can be very confused about some of them while still being saved. I don’t want to start listing off all the ways the Bible talks about the atonement and how confused you can be about them while still being saved. Let’s just say that what is required is the core of the gospel—that the remedy is that Jesus Christ, the Son of God, who never sinned got in my place and took the wrath of God for me. He died in my place. In John 14:6, the Bible tells us very clearly that Christ is the only way to God and eternal life, and in Romans 10:9–11, the Bible tells us how to be saved and have eternal life: Believe in our hearts that Jesus died for our sins and was raised from the grave, and confess with our mouths that He is our Lord and Savior. Notice that he didn’t ask Jesus to stop his pain, although he would have been in excruciating pain on the cross. By that time, Jesus was famous for doing miracles, but the man didn’t ask Jesus to save him from death, either. He said, “Jesus, remember me.” Why? Because he knew that his deepest need was salvation from sin — not just salvation to get into Heaven. He believed in Jesus. The Bible says in Acts 16:31, “Believe in the Lord Jesus, and you will be saved” (NIV). So how do you know for sure that you’re saved? How do you know you’re going to Heaven when you die? How can you be certain? How can you eliminate your doubt? Your assurance of salvation is not by your works, because you can’t earn your salvation. Your assurance of salvation is not by your feelings, because feelings come and go. What is your assurance of salvation? The promise of God’s Word. If God says it, that settles it, because God cannot lie. You can trust the promise of God’s Word. You can rest in it. These are just a few of bigger names in the thousands upon thousands of people that are leaders influencing believers and non-believers alike. I am are NOT going to confirm or refute their answers above in this post, I am simply going to go to the text and see what Yeshua (Jesus) has to say when asked this very question. I will let you come to your own conclusions. Yeshua (Jesus) doesn’t answer him directly. He does what Rabbis (teachers) do – He teaches. Instead of answering, he asks the man 2 questions. “How do YOU read it?” Awesome question, huh?!? “The RIGHT answer!” “You will have life!” Uh-oh! The “Dogma Detector” is beeping like crazy now!!! But like some of you reading this right now, you want to justify your theology – your dogma – your theological suppositions. You want to rationalize (attempt to make the unreasonable sound reasonable). The lawyer did too. . .
Well, lawyer my friend, you just asked for another lesson from the Rabbi (Teacher) Yeshua – and what an excellent lesson it is! when he was attacked by robbers. then went off, leaving him half dead. but when he saw him, he passed by on the other side. also passed by on the other side. The Greek word for compassion here is (splanchnizomai) in a word mercy (sympathy, pity). So he went up to him, put oil and wine on his wounds and bandaged them. Yeshua has the lawyer answer his own question AGAIN! It seems the lawyer is pretty bright and knows the text pretty well. After all, if the text is the inspired word of God, and God and Yeshua are one, then Yeshua would seem to me like the MOST qualified person EVER to answer this lawyer’s question, wouldn’t you agree? So how does the lawyer answer? Right answers aren’t all that is required, are they? Understanding . . . that is what always seems to be lacking. Remember what the text says? OY VEY! Yiddish for (Oh the pain!) This can’t be right, can it? Yeshua is telling this guy to go out and do, (heaven forbid), works?!? You see, mercy is a work. Loving-kindness (grace) is a work. But make no mistake, works in-and-of-themselves are nothing. We could do all the the works in the world and they would not matter without the love the Creator showed us – the mercy He showed us by sending His one and only unique son to bleed so that there could be forgiveness of sins. 12 he entered the Holiest Place once and for all. thus setting people free forever. so that we can serve the living God! that he is mediator of a new covenant [or will]. those who have been called may receive the promised eternal inheritance. it never has force while its maker is still alive. 7 and you are to teach them carefully to your children. 2 “Speak to the entire community of Isra’el; tell them,‘You people are to be holy because I, Adonai your God, am holy. 3 “‘Every one of you is to revere his father and mother,and you are to keep my Shabbats; I am Adonai your God. 11 “‘Do not steal from, defraud or lie to each other. which would be profaning the name of your God; I am Adonai. you are not to keep back the wages of a hired worker all night until morning. or place an obstacle in the way of a blind person; rather, fear your God; I am Adonai. but with justice judge your neighbor. but also don’t stand idly by when your neighbor’s life is at stake; I am Adonai. so that you won’t carry sin because of him. 32 “‘Stand up in the presence of a person with gray hair, show respect for the old; you are to fear your God; I am Adonai. 33 (RY: vi, LY: iv) “‘If a foreigner stays with you in your land, do not do him wrong. 34 Rather, treat the foreigner staying with you like the native-born among you — you are to love him as yourself, for you were foreigners in the land of Egypt; I am Adonai your God. I have given you the context around the words answered to Yeshua by the lawyer. The words Yeshua said were correct. There were no verses or chapters when the lawyer answered Yeshua – they didn’t come into existence until very much later. Context would be expected to be known by any Rabbi or Torah teacher. They would know more than a single line (or verse as we call it). This is not something any of the teachers and preachers that I quoted above address in their responses. Why? You would have to ask them directly. That no one quotes the above may very well be one of the reasons we have such a big problem in the assemblies today – the teachers are teaching theological suppositions, dogmas, and theories. Yeshua is not. He is very clear here – the question is answered succinctly. If we didn’t have to battle theological suppositions, dogmas, and theories, this page could have been a simple quote of the text regarding his interaction with the lawyer and his question. If we didn’t have to battle theological suppositions, dogmas, and theories, more teachers answers would have matched the Lord of Lords and Host of Host’s answer. accompanied by all the angels, he will sit on his glorious throne. 41 “Then he will also speak to those on his left, saying, ‘Get away from me, you who are cursed! Go off into the fire prepared for the Adversary and his angels! 34 “Then the King will say to those on his right, ‘Come, you whom my Father has blessed, take your inheritance, the Kingdom prepared for you from the founding of the world. 37 Then the people who have done what God wants will reply, ‘Lord, when did we see you hungry and feed you, or thirsty and give you something to drink? There is no mistaking what Yeshua is teaching here. He is teaching mercy. He is teaching love. Love is not a feeling, love is a command. Love is a work. Showing mercy to others is a work. Refusal to love – refusal to show mercy is evil. It has dire consequences . . .
Not eternal life . . . eternal punishment. Is this overwhelming you? Are you trying to rationalize (attempt to make the unreasonable sound reasonable) your theological suppositions, dogmas, and theories? Why would you do this? Are the words of our Master Yeshua the Messiah not enough? 16 “Wash yourselves clean! Get your evil deeds out of my sight! Seek justice, relieve the oppressed, defend orphans, plead for the widow. You see, the problem with theological suppositions, dogmas, and theories is that they are always exposed by the text if they are not congruent with the text. Sad part is that many defend the theological suppositions, dogmas, and theories over the text that corrects or refutes them. Now for the final part. The part that is a key to helping your understand it all – without theological suppositions, dogmas, and theories getting in the way and obscuring the actual word of God. This is God speaking. This is His word. This is what His word says. but you are arguing with the word of God, not me. I won’t even go down the road with you. So when you tell someone how to have eternal life by scripture, remember that ALL of the scripture is DEPENDENT on the 2 most important commands per Yeshua. And guess what folks, if you don’t show mercy and grace to your fellow man (neighbor – enemy and friend), then you can’t love God . . . per the text! but that everyone should turn from his sins. so that through him we might have life. but that he loved us and sent his Son to be the kapparah for our sins. “Wouldn’t I prefer that he turn from his ways and live? by acting in accordance with all the disgusting practices that the wicked person does, will he live? for the trespasses and sins he has committed, he will die. Listen, house of Isra’el! Is it my way that is unfair? or your ways that are unfair? for the wickedness he commits he will die. he will save his life. he will certainly live, not die. House of Isra’el, is it my ways that are unfair, or your ways that are unfair? according to his ways,” says Adonai Elohim. so that they will not be a stumbling block that brings guilt upon you. for why should you die, house of Isra’el? “so turn yourselves around, and live! This is the lesson. It has a simple answer that has been obscured by theological suppositions, dogmas, and theories. These theological suppositions, dogmas, and theories actually battle the word of God at times. The answer is simple. Love God with all you got and love your neighbor as yourself. Show mercy and loving-kindness to your fellow man the same way our Master and King showed mercy to us. The entire text is dependent on these 2 commandments. John 3:16 is dependent on these 2 commandments. All of the text the pastors and teachers above quoted are dependent on these 2 commandments. This entry was posted in Living life Even if . . . and tagged dependent, eternal life, Jesus, prophets, salvation, torah, Yeshua. Bookmark the permalink.